Quiz time. Which of the following statements about the sustainability of vertical farming (compared with conventional agricultural farming) are correct? Not 100% sure? Don’t worry, this post will help you to separate facts from fiction. The High Level Panel of Experts on Food Security and Nutrition (HLPE) on Food Security and Nutrition defines a sustainable food system as “a food system that delivers food security and nutrition for all in such a way that the economic, social and environmental bases to generate food security and nutrition for future generations are not compromised.”1 In one of our recent posts, we wrote that although there is no single solution for creating a complete sustainable food system, introducing vertical farming methods next to other farming practices can help promote these economic and social bases. For instance, vertical farming uses empty buildings with several stories as modern farms to creatively renew neglected neighbourhoods. Did you know that several companies in the city of Detroit use the city’s vacant warehouses to grow leafy vegetables which are then sold to their local community? 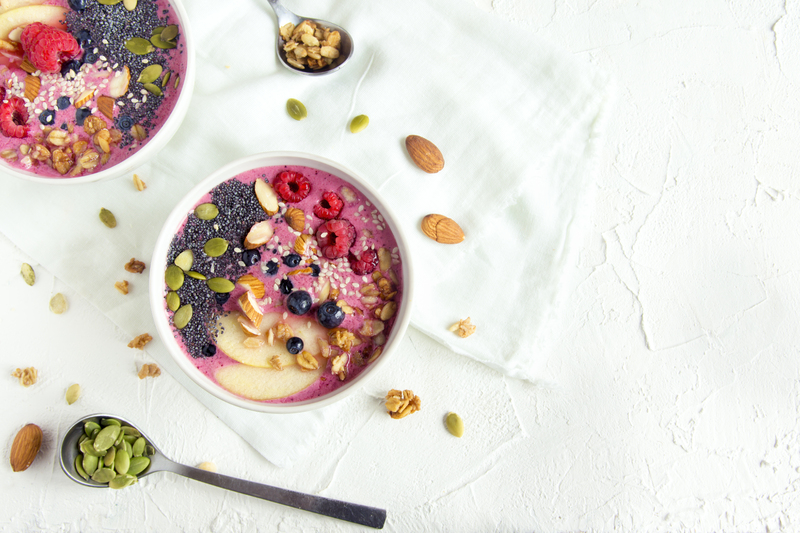 While vertical farming can help improve community’s economic and social bases, most of the debate surrounding its sustainability is centred around its environmental base. Sustainability also depends on the efficient use of local resources such as water and land. Vertical farms use these resources more efficiently than greenhouses and conventional agricultural methods. Vertical farms, on the other hand, can reduce their water usage to the volume of a medium-sized pan. 4 How? Well, the only water that is extracted from its system is the water from inside the crop during its harvest. Vertical farms also achieve a higher crop yield. If you grow lettuce on an agricultural field of 1x1 meter, you can yield 3.9 kg every year. 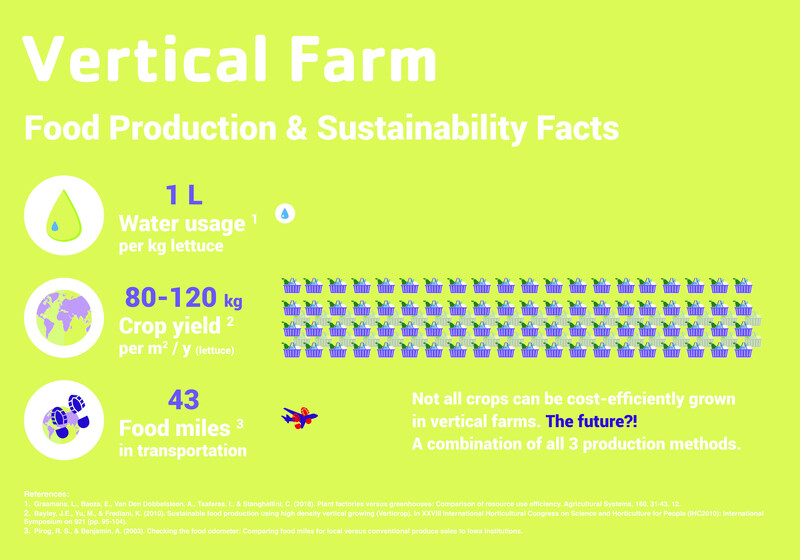 When lettuce is grown on the same acreage in a greenhouse, 41 kg can be harvested.3 Vertical farms can even yield twenty times more lettuce than agricultural fields.5 Additionally, vertical farms often use hydroponics or aeroponics methods to grow crops without soil. 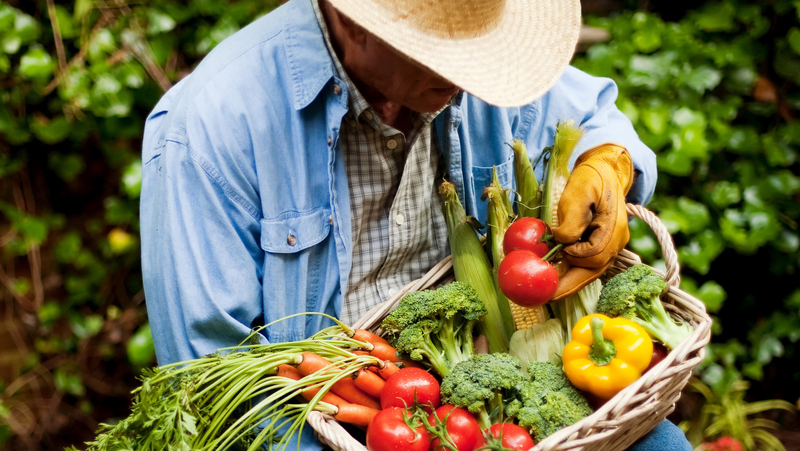 Hereby, it can support the supply of fresh produce despite the expected future scarcity of land. Local production also skips several steps in the supply chain. This benefits the crops’ freshness since their travel time is reduced by approximately one week. Local production also improves the traceability of crops and overall reduces its agricultural waste. Nothing is environmentally perfect (yet). The biggest downside of vertical farms is the large amount of energy it takes to grow crops: between 30-176 kWh per kg more than greenhouses. With that difference in energy, you could run your washing machine approximately 132 times. However, the energy used in vertical farms is not wasted, with their energy efficiency considerably higher than greenhouses.4 With cities moving towards more renewable sources of energy, vertical farms could further reduce their carbon footprint by purchasing or producing their own clean energy. What do you think? Do the sustainable aspects of vertical farming weigh up against its main environmental downside? Or should the amount of purchased energy be reduced before we can talk about a more sustainable food system? Let us know! 2. Benke, K., & Tomkins, B. (2017). 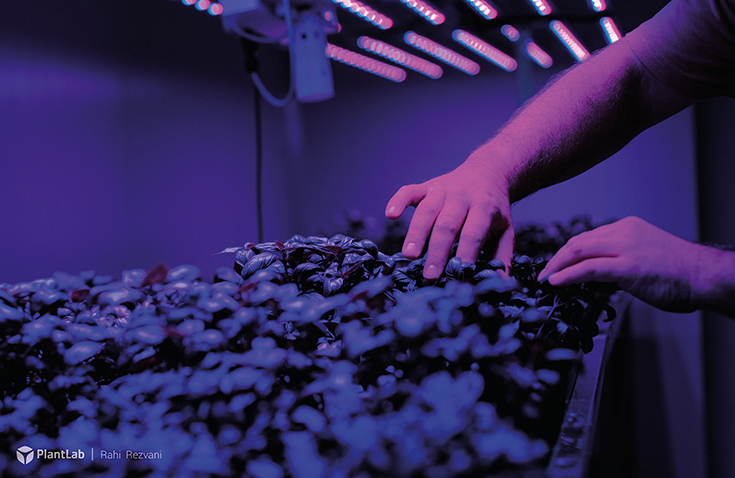 Future food-production systems: vertical farming and controlled-environment agriculture. Sustainability: Science, Practice and Policy, 13(1), 13-26. 3. Barbosa, G.L., Gadelha, F.D.A., Kublik, N., Proctor, A., Reichelm, L., Weissinger, E., Wohlleb, G.M., Halden, R.U. (2015). 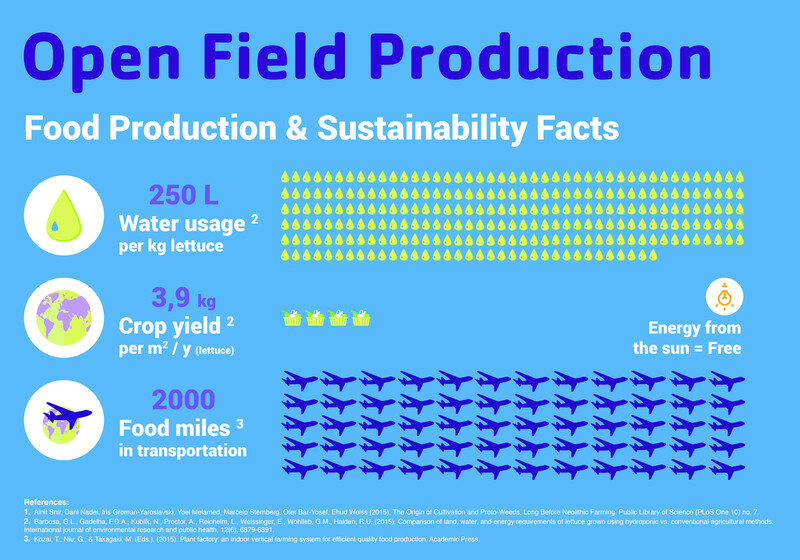 Comparison of land, water, and energy requirements of lettuce grown using hydroponic vs. conventional agricultural methods. International journal of environmental research and public health, 12(6), 6879-6891. 4. Graamans, L., Baeza, E., Van Den Dobbelsteen, A., Tsafaras, I., & Stanghellini, C. (2018). 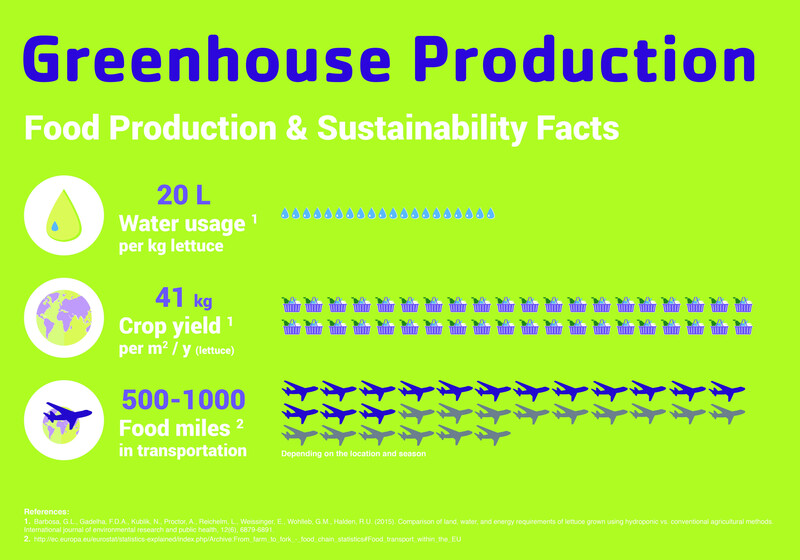 Plant factories versus greenhouses: Comparison of resource use efficiency. Agricultural Systems, 160, 31-43. 5. Bayley, J.E., Yu, M., & Frediani, K. (2010). Sustainable food production using high density vertical growing (Verticrop). In XXVIII International Horticultural Congress on Science and Horticulture for People (IHC2010): International Symposium on 921 (pp. 95-104). 6. Kozai, T., Niu, G., & Takagaki, M. (Eds.). (2015). Plant factory: an indoor vertical farming system for efficient quality food production. Academic Press. 7. Molin, E., & Martin, M. (2018). Assessing the energy and environmental performance of vertical hydroponic farming. Vera Colstee works in Business Development for PlantLab bringing together Agro Technology and the Food Industry. She manages projects from plant-derived ingredients to concept development and is passionate about enhanced plant growth by vertical farming, to explore the taste and aroma profiles of plants. Vera received a Bachelor of Science in Food Design & Innovation. Vera enjoys cooking and experimenting in the kitchen, especially infusing (alcoholic) beverages with all kinds of food products to shake vivid cocktails.